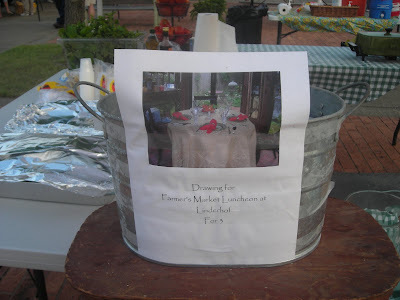 Almost a year ago today, I was the "Guest Chef" at our local Farmer's Market. It was their Tomato Festival and everything I served had tomato in it. It was a fun time and I enjoy spending the morning at the Farmer's Market. And I enjoy sharing my cooking and recipes with those who come to buy fresh produce. I thought this was a good post to share as Saturday I was back at the Farmer's Market. It was not the Tomato Festival this year, however. 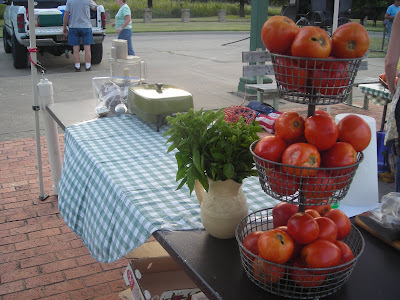 I will share the 2010 Farmer's Market experience this Wednesday -- this Outdoor Wednesday. So take a step back in time to 2009 and my August Saturday at the Farmer's Market . . . and join Chari at Happy to Design to see what other favorites there are this Sunday. 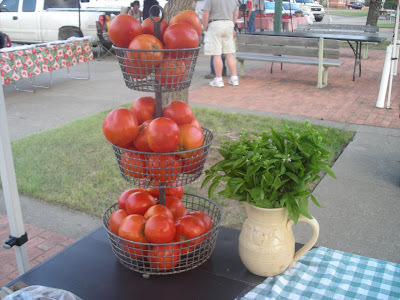 Last Saturday was the Tomato Festival at the Farmer's Market. I was asked to be the "Guest Chef" for the event. All of my food was to be "tomato food" . . . or almost. I spent most of Friday making 4 loaves of bread, 120 plus tomato spice muffins, gallons of a cream of tomato soup (to be served chilled). 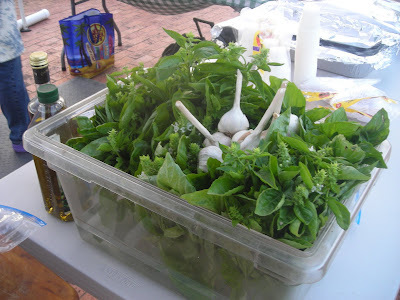 I was given the huge container of basil to be used with the tomatoes and organic garlic. And whenever I do any class or demonstration, I always give away a luncheon at my home -- everyone loves to win something and it's my way to contribute to make the event better. With the three tiers of tomatoes, I made fresh pasta sauce (chopped tomatoes, garlic, basil, olive oil and a splash of balsamic vinegar) which we tossed with pasta which I had also fixed at home. With the abundance of basil, I made pesto which we also tossed with the pasta. The fresh pasta sauce, we also used as a bruschetta topping. I grilled bread, put the tomato topping on, added some cheese, and let it melt before serving. We served small plates with a mini muffin, a small cup of soup (garnished with fresh basil) and a pasta. The bruschetta replaced the muffin after we ran out. We called it "breakfast, lunch and dinner with tomatoes on a plate". Our goal was to show that tomatoes was not just for slicing or BLT's. We estimated that over 300 people came to the Farmer's Market last Saturday -- a pretty good turnout for our little town. It was a fun Saturday morning and I thoroughly enjoyed the tomato festival! Please join Susan at A Southern Daydreamer to see more of the great outdoors this Wednesday. What a delicious challenge! And, I'd say you more than rose to the occasion! I think giving away a luncheon at Linderhof is a wonderful reward for some lucky market shopper. Can't wait to see what happened this year. Yes, our newest member of the family is Oliver. His registered name (by the breeder) is Dakota's Devil May Care. Oliver suits him better! Early to be posting Martha, where is spell check when I need it! It's all about tomatoes this time of year. I'm busy roasting and freezing what I picked this weekend. I might like to try making the tomato spice muffins. Those sound pretty tasty. What a great way to promote your farmers' market. I'm sure having the presentations encourages people to come to the market. Ohhh...what fun! I bet everyone really enjoyed all of your tomato recipes, food, and presentation! You are always sooo good at this sort of thing! I love tomatoes! In fact, I just came from the kitchen where I was standing over the sink with a bowl full of homegrown cherry tomatoes and the salt shaker! Hehe! Hmmm...tomato muffins? That sounds interesting and yummy! My grandma used to always make tomato jam...I loved it! Well my friend, thank you so much for sharing this awesome experience with us for Sunday Favorites today! I will be watching for your 2010 festival post! Now, if I were to win the luncheon at Linderhof, would it include airfare and a night in the newly spiffed-up guest room? What fun to be a guest chef for something like this -- and what you made sounds delicious. But, tomato bread? That's a new one on me! It is pouring rain here today-- this means we'll have to mow the lawn!